I’ve been dying to share this recipe with you guys! Believe it or not, I haven’t had a whole lot of success with actual cheesecakes. Yes, I’ve made a few in the past, but they’ve always had falling or cracking issues. 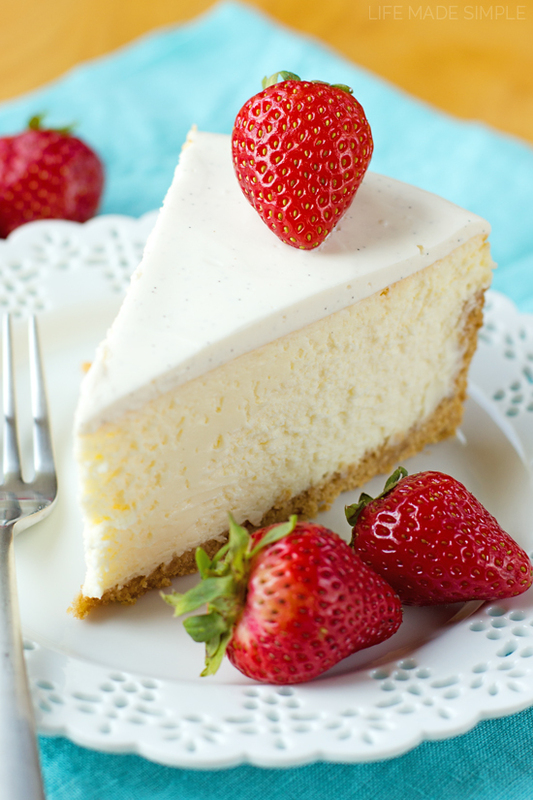 That’s why I’ve stuck with what works… mini cheesecakes! I love my pan dearly and have had so much fun making all of these bite-size treats! However, the other day we got news that a dear friend from Brazil was on his way to visit us here in Utah. I promised him 4 years ago that whenever he came to see us, I’d make him an authentic New York cheesecake. That was sort of silly of me, right?! Especially considering my track record. I guess I work well under pressure though, because this cheesecake was perfection! As soon as we got the call, I hopped online and started searching for recipes. I wanted something classic and simple. That’s when I discovered a recipe form the culinary guru, Dorie Greenspan. If you’ve never peeked inside of her amazing cookbooks, you’ve gotta take a trip down to Barnes & Noble and spend some quality time with them! Amazing. The recipe was approachable and promised perfection. I’d say that was pretty darn accurate. I picked up the needed ingredients from the store and let all everything come to room temperature (a very important step when making cheesecake). After baking the crust and making the filling, I anxiously poured in the water bath into the roasting pan and placed everything into the oven to bake. All I could do was cross my fingers and hope for the best. I paced back and forth, checking the cheesecake every 15 minutes or so. I really wanted it to turn out! At the hour and a half mark I knew it was all going to be ok. I mean look at that golden beauty above! I was giddy. I couldn’t believe how perfect it was. Not only did it rise beautifully, but it didn’t fall! The only visible flaw was a teeny tiny little crack… it fixed itself as it cooled. I think the gently cooling process was an incredibly smart idea, one I’ll definitely be using in the future. Yes, I’ll be making more of these bad boys in the future, you can count on that! During the chilling process I added a thin layer of sweetened vanilla bean sour cream to the top. It set beautifully as it finished resting in the refrigerator. When the time came to slice into and serve our friend, I knew I had nailed it. Not only was it easy to slice, but it came out looking like something you’d buy at the Cheesecake Factory. He loved it and so did we. Success! I can’t wait to use this base again and create all sorts of wonderful things with it! Thick, dense and ultra-rich, this perfect New York cheesecake is so easy it’s fool-proof! Preheat oven to 350 degrees, placing the top rack in lower third of oven. In a large mixing bowl, mix together the finely ground graham cracker crumbs with the sugar and salt. Pour the melted butter over top and mix until the crumbs become coated. Pour into the prepared springform pan and gently smooth out (I like to use a metal measuring cup for this). Carefully work the crumbs up the sides so that they are 1 1/2″ tall and approximately 1/4″ thick. You should have a nice layer on the bottom and the sides should go about halfway up your pan. Place into the oven and bake for 8-10 minutes or until lightly golden brown. Turn oven down to 325 degrees. Beat the cream cheese, salt and vanilla in the bowl of a stand mixer for approximately 4 minutes or until smooth and creamy. With mixing speed on low, gradually add the sugar, then turn back up to high and beat for an additional minute. With mixing speed on low, add the eggs one at a time, mixing until incorporated. Add the sour cream, then the heavy cream, beat on high for 1 minute. Place the prepared springform pan into a large high-sided roasting pan. Pour the cream cheese filling into the springform pan, smoothing out the top with a spatula. Pour boiling water around the springform pan, taking care not to get any on the filling. You’ll want the water to go halfway up the side of the pan (this was just to the lip of my 2″ tall cake pan). Place in the oven and bake at 325 degrees for 1 hour and 45 minuets. 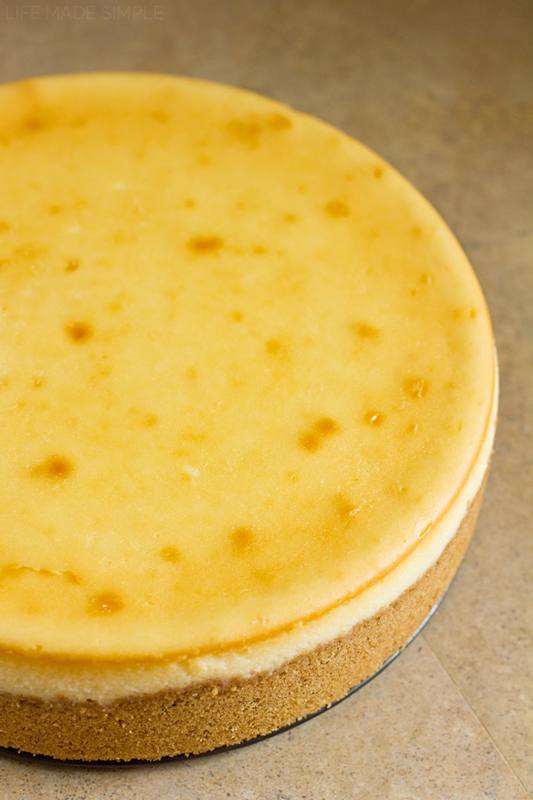 If you like extra firm cheesecake, continue baking for an additional 14 minutes for a total of 2 hours. After the cheesecake has baked, turn off the oven, slightly crack the door open and allow to cool for 1 hour. This is the key to getting a perfect top without it falling or cracks forming. Remove the cheesecake from the bath and dry the bottom of the pan. Place in the refrigerator on a wire cooking rack to chill for at least 4 hours before serving, I prefer 6+ hours. Wrap the top of the cheesecake with foil after 30 minutes in the refrigerator (giving the cheesecake 30 minutes will help prevent condensation from forming on the underside of the foil). Prepare the topping by combining all of the ingredients in a mixing bowl and stirring together until smooth. 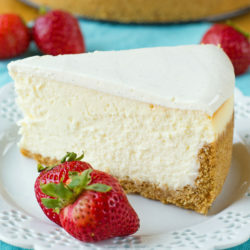 Using a spatula, spread over the top of the cooled cheesecake (you can also do this at about 3 hours into the chill time so that it can set during that remaining hour). 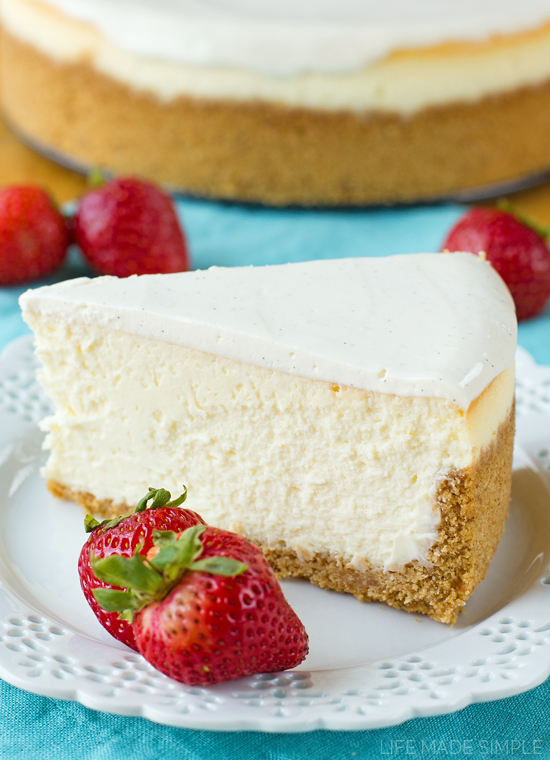 During the chilling process the cheesecake should come away from the edges of the pan, making it easy and mess-free to remove it before serving. 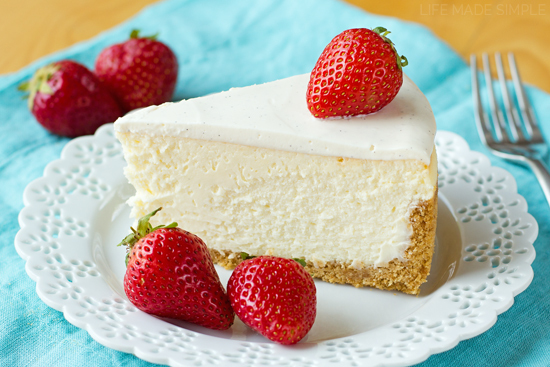 -Fresh fruit, nuts or decadent swirls make great additions to this cheesecake. You can also top it with pretty much anything your heart desires! -This can be made gluten-free by using gluten-free graham crackers. Adapted from Dorie Greenspan via Simply Recipes.